A new exhibition opening at the Hope College Kruizenga Art Museum on Friday, Sept. 21, explores the beliefs and practices of the Ethiopian Orthodox Church as they are reflected in contemporary paintings, icons, liturgical objects and other works of art. The 67 artworks in the exhibition were collected and donated to the Kruizenga Art Museum by Dr. Neal Sobania, a Hope alumnus from the Class of 1968 who was a Peace Corps volunteer in Ethiopia and later went on to make Eastern Africa the focus of his academic career. The exhibition will continue through Saturday, Dec. 15. According to Mason, most contemporary Ethiopian Orthodox Christian art is made, as it was in past centuries, by deacons, priests, monks and other artists with significant religious training. In Ethiopia, religious art is used mainly in churches and monasteries to assist in the performance of public services and private devotions, to decorate buildings and to provide religious instruction. 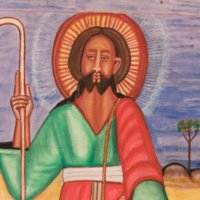 Some contemporary Ethiopian Orthodox Christian art is also made for sale to tourists and collectors, as well as for Ethiopian churches serving Diaspora communities overseas. The artworks featured in the exhibition were collected and donated by Neal Sobania and his wife, Elizabeth, of Lakewood, Washington. After graduating from Hope College in 1968, Neal Sobania joined the Peace Corps and served for four years in Ethiopia. A few years later he lived and worked in Kenya doing graduate research and working for the United Nations Environmental Program. He continued to develop his interest in those countries during and after graduate school and has made Eastern Africa the focus of his academic career for more than fifty years. As Sobania’s career progressed, he became more intentional about his collecting and focused on acquiring works by artists who are recognized and respected by the communities in which they live. He acquired much of the art featured in the exhibition in the holy city of Aksum, in northern Ethiopia. Home to the Church of Our Lady Mary of Zion, the spiritual headquarters of the Ethiopian Orthodox Church, Aksum has long been a vital center for the production of Ethiopian religious art. By visiting Aksum repeatedly over a period of more than three decades, Sobania formed strong relationships with many artists and shopkeepers and was able to assemble a collection of rare quality and depth. Sobania was director of international education and a member of the history faculty at Hope from 1981 to 2005. He was subsequently at Pacific Lutheran University, where he was executive director of the Wang Center for Global Education and a professor of history, retiring in 2016. Sobania will deliver a public lecture about his collection and the exhibition on Friday, Sept. 21, at 4 p.m. in the Fried-Hemenway Auditorium in the Martha Miller Center for Global Communication on the Hope College campus. The lecture will be followed by a reception at the Kruizenga Art Museum from 5:30 p.m. to 7 p.m. On Saturday, Sept. 22, at 2 p.m. Ethiopian-born artist and 2003 Hope alumnus Daniel Berhanemeskel will speak at the Kruizenga Art Museum about traditional Ethiopian painting materials, techniques and styles. Admission to both lectures, the reception and the exhibition is free, and all are welcome. The exhibition will be accompanied by a fully illustrated digital catalog that can be downloaded free of charge from the Kruizenga Museum website as soon as the exhibition opens. The museum, which is open Tuesdays through Saturdays from 10 a.m. to 4 p.m., functions as an educational resource for Hope College and the greater West Michigan community. The museum features two public galleries as well as a classroom and climate-controlled storage space for its 3,000-object permanent collection. It is named in honor of a leadership gift from Dr. Richard and the late Margaret Kruizenga of Holland, both of whom graduated from Hope in 1952. Additional information is available at hope.edu/kam. The Kruizenga Art Museum is located at 271 Columbia Ave., between 10th and 13th streets. The Martha Miller Center for Global Communication is located at 257 Columbia Ave., at the corner of Columbia Avenue and 10th Street.